U.S. President Donald Trump speaks next to Federal Communications Commission Commissioner Ajit Pai during an event on U.S. 5G deployment in the Roosevelt Room of the White House in Washington, April 12, 2019. "We cannot allow any other country to outcompete the United States in this powerful industry of the future," Trump said in the White House Roosevelt Room, flanked by a group of telecommunications tower climbers and farmers. "The race to 5G is a race that we must win." 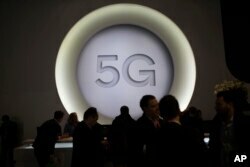 FILE - People stand next to a 5G logo during the Mobile World Congress wireless show, in Barcelona, Spain, Feb. 28, 2018. "We don't want to do that. It wouldn't be nearly as good, nearly as fast," Trump said. "The idea of state-designed and -operated 5G networks in the U.S. makes no sense on its own terms. A competitive, lightly regulated market is the hallmark of the U.S. system. This has delivered success in 4G and will encourage investment and innovation in 5G," London-based Gabriel Brown, a principal analyst at telecommunications research firm Heavy Reading, told VOA. "It also makes no sense in relation to competition with China — these are different markets in different phases of development." Riley Walters, a policy analyst at the Heritage Foundation's Asian Studies Center, agreed, saying the "private sector is the most efficient way to distribute 5G capabilities, even if it's not at the pace nationalization proponents would like to see. Deregulation should help cut the costs for domestic developers to move up their time horizon." "We want Americans to be the first to benefit from this new digital revolution while protecting our innovators and our citizens," said FCC Chairman Ajit Pai. "We don't want rural Americans to be left behind." 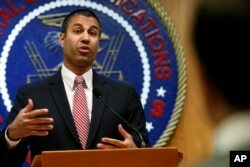 FILE - Federal Communications Commission Chairman Ajit Pai answers a question from a reporter in Washington, Dec. 14, 2017. "Intervention at this level will encourage private investment and accelerate coverage in these hard-to-reach areas — the economic and social benefits of rural coverage make it worth intervening to help make the market work," Brown said. "Creating a national fund to support these innovators is a great idea," said Prakash Sangam, the founder of Tantra Analyst, which is involved in marketing and business development of wireless technology. "I also suggest that the U.S. government intervene and facilitate the resolution of conflicts between American technology companies so that they collaborate and effectively compete against the companies sponsored by foreign governments." One challenge is the lack of U.S. manufacturers of 5G network equipment, an arena where China's Huawei and ZTE are set to dominate. Trump's 5G goals are in conflict with the Federal Trade Commission's stance on Qualcomm, the world's largest chipmaker. The FTC has sued the American company over anti-competitive pricing, according to technology analyst Patrick Moorhead, president and principal analyst at Moor Insights & Strategy. 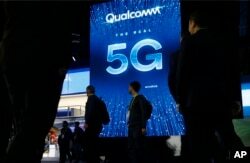 "Qualcomm is the country's only hope for 5G and 6G leadership and with the FTC about to potentially hobble it, the U.S. will never be a leader, China will," predicted Moorhead, a former industry executive. A State Department senior official on Wednesday said the security concerns about Huawei and ZTE extend to all companies headquartered in China, contending they are effectively "under direction" of the Chinese Communist Party. "It's very important to distinguish how Western democracies operate relative to their private sector companies and vendors, and how the Chinese government operates with its companies," said Ambassador Robert Strayer, deputy assistant secretary for cyber and international communications and information policy. Trump did not mention the Chinese companies in his remarks Friday, but he said America's 5G networks will "have to be guarded from the enemy." Riley, at the Heritage Foundation, told VOA that the United States "can still limit the proliferation of imports that have a security concern, but it will be hard for U.S. companies to compete in price in external markets." South Korea last week switched on its nationwide 5G network. South Korea-based Samsung is offering itself as a global alternative to Chinese equipment manufacturers, but it still lags Huawei and ZTE, as well as Sweden's Ericsson and Finland's Nokia. "There are proposals to free some of it for fixed wireless, and the mobile industry wants it for 5G," Brown said. A previous version of this story misspelled Patrick Moorhead's last name. VOA regrets the error.